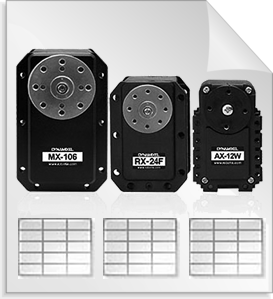 The MX-64AT Dynamixel Robot Servo Actuator is the newest generation of Robotis Dynamixel actuator; equipped with an onboard 32bit 72mhz Cortex M3, a contact-less magnetic encoder with 4x the resolution over the AX/RX series, and up to 3mpbs using the new TTL 2.0 bus. Each servo has the ability to track its speed, temperature, shaft position, voltage, and load. As if this weren't enough, the newly implemented PID control algorithm used to maintain shaft position can be adjusted individually for each servo, allowing you to control the speed and strength of the motor's response. All MX Series servos use 12v nominal voltage, so MX Dynamixels can be mixed without having to worry about separate power supplies. All of the sensor management and position control is handled by the servo's built-in microcontroller. This distributed approach leaves your main controller free to perform other functions. The MX-64AT is a special version of the MX-64T with an aluminmun front plate. This plate acts as a heat sink, allowing for better heat dissapation, allowing the servo to run cooler. The aluminum front plate has threaded holes, allowing for easier assembly as no nuts need to be seated on the front plate. The back plate will still require nuts. NOTE: The MX-64AT is special order only and may take an additional 1-2 weeks to ship. If you want to control this DYNAMIXEL servo from an Arduino Compatible microcontroller, check out the ArbotiX-M Robocontroller. The ArbotiX-M Robocontroller was designed to take all the guesswork out of controlling DYNAMIXEL servos from the Arduino Envinroment. We have Arduino libraries for the DYNAMIXEL servos and and 3-pin TTL DYNAMIXEL servo will plug directly into the ArbotiX-M. For tips on getting everything you need to get your ArbotiX/DYNAMIXEL project off the ground, see out our ArbotiX-M/DYNAMIXEL Buying Guide.